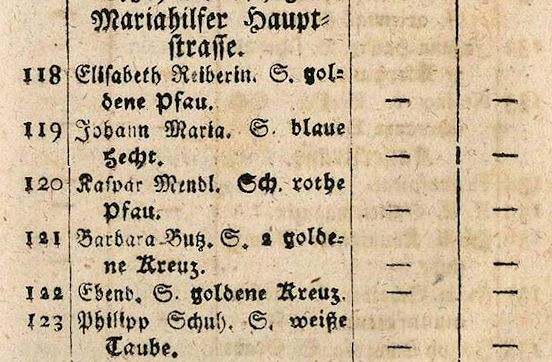 Mozart's first child Raimund Leopold died on 19 August 1783 in the house Oberneustift No. 250 while his parents were still in Salzburg. 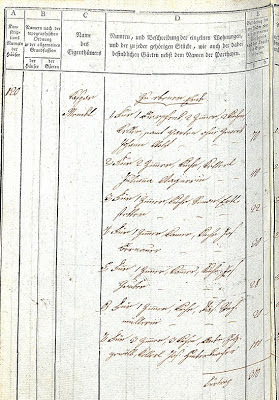 The entry concerning the burial of Raimund Leopold Mozart on 21 August 1783 in St. Ulrich cemetery (St. Ulrich, Tom. 23, fol. 83r). [Mariahilfer Straße] Nr. 94, Zum roten Pfau, jetzt Rudolfshof. In diesem Hause starb am 19. 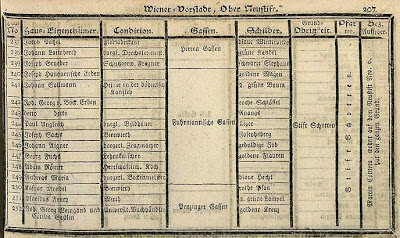 August 1783 der erstgeborene Sohn Mozarts, Raimund, geb. 18. Juni 1783. It is quite intriguing to figure out the origin of Deutsch's and Angermüller's wrong addresses. 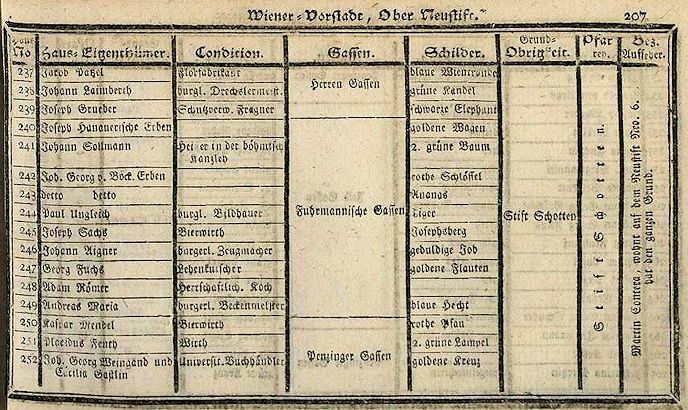 In general (with a number of exceptions) Viennese houses had three different Konskriptionsnummern which were assigned in three numberings in 1770, 1795 and 1821. But the numberings of houses in certain Viennese suburbs show puzzling irregularities and the district of Oberneustift is such a case. 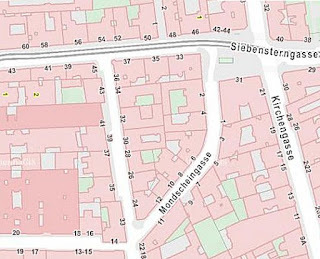 Because parts of Oberneustift in the early 18th century were merged into the districts of Schottenfeld and Neubau, O. E. Deutsch chose the house in Schottenfeld which in 1795 bore No. 250 (i.e. Lerchenfelderstraße 65). 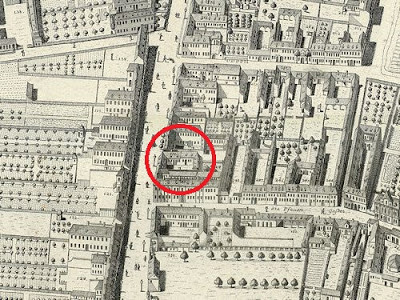 Following a similar logic Angermüller picked the house that in 1795 was Neubau No. 250 (i.e. Neustiftgasse 104). 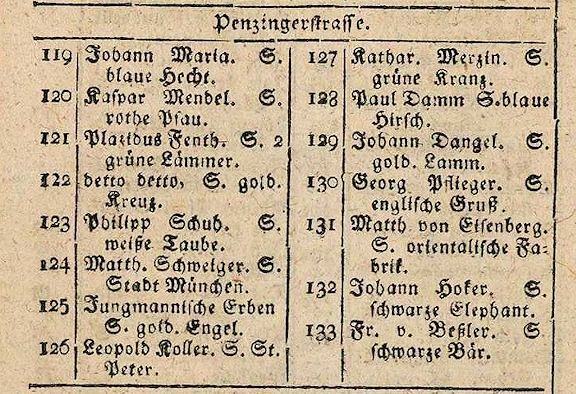 Both Deutsch and Angermüller were unaware of the fact that some houses in Oberneustift were already renumbered before 1795. Between 1786 and 1788 the house Oberneustift No. 250, "Zum roten Pfau" (in the street which at that time was named "Penzingergasse") was assigned the new number 120. 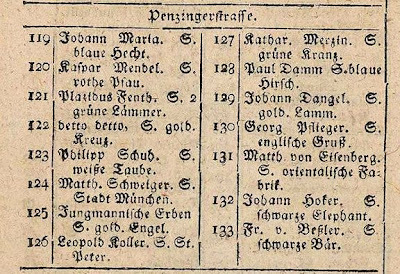 Part of Ober-Neustift in a 1779 house directory: the "Roter Pfau" is No. 250. In 1786 Kaspar Mendel's house in the Penzingergasse still bore No. 250. 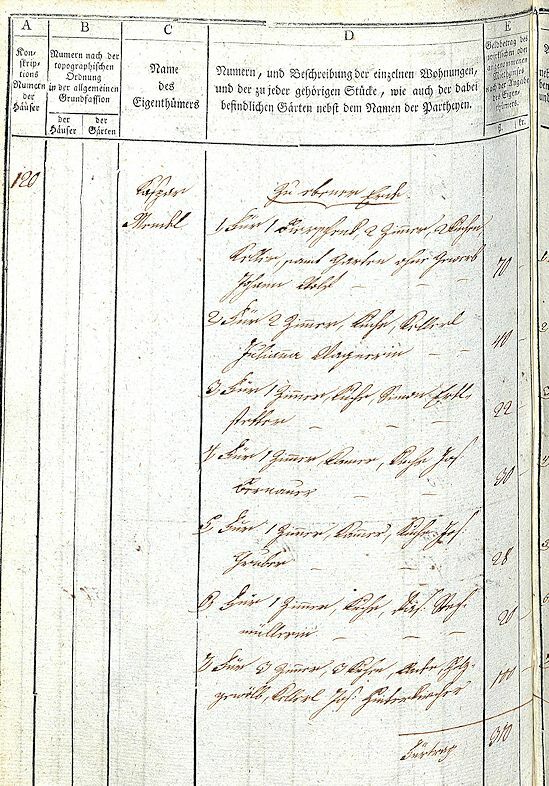 The house in the 1787/88 tax register, already bearing number 120. Here we see that the inn on the groundfloor was run by a certain Johann Wolf. The house's number 120 in a 1789 directory (the letter S. means Schild [sign]). 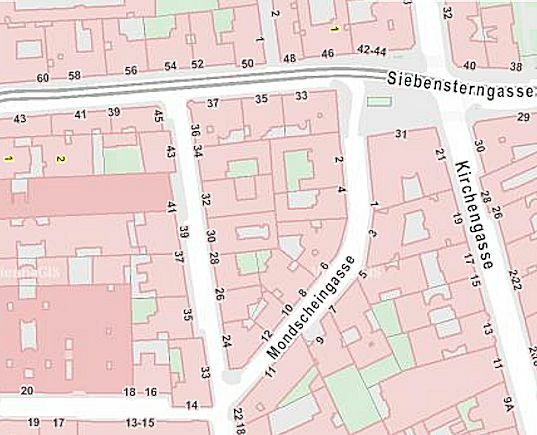 By 1798 the Penzingergasse has been renamed "Mariahilfer Hauptstrasse". Kaspar Mendel's house is still No. 120. In the commentary of the paperback edition of Mozart's letters (vol. 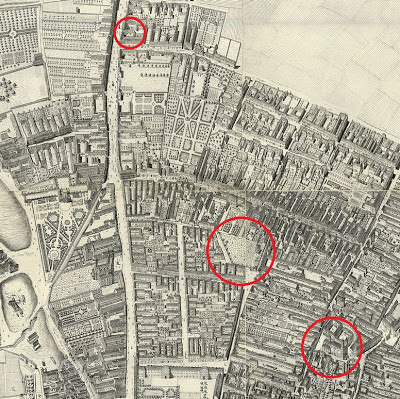 VI, p. 145) the wrong address "Lerchenfelderstr. 65" appears again, together with hundreds of other mistakes in the commentary of this outdated edition that will not be corrected in the near future as long as the Mozarteum will be in charge of the edition of Mozart's letters. The house Oberneustift 250, "Zum rothen Pfau" in 1773. In his 1919 article "Mozarts Kinder" (which he republished in 1923 in his book Aus Mozarts Freundes und Familienkreis) Emil Karl Blümml wrote regarding Raimund Leopold Mozart's place of burial: "[...] dem Tage des Begräbnisses, an dem der kleine Mozart im längst aufgelassenen Friedhof um die St. Ulrichskirche beigesetzt wurde." ("the day of the burial, on which the little Mozart was buried in the long-abandoned cemetery around the church of St. Ulrich"). Blümml's information is wrong. The property records of the Scottish Abbey show that there was no cemetery around St. Ulrich's church. The old cemetery of St. Ulrich was located uphill, one block south of the church in the area between Siebenstern-, Mondschein-, and Zollergasse. 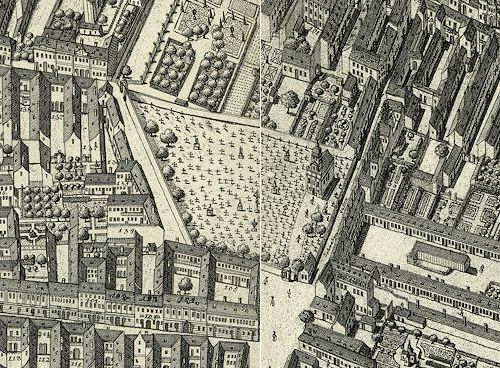 The quadrangle, south of the Siebensterngasse in the Viennese district of Neubau where from 1590 until 1784 the old cemetery of St. Ulrich was located. The same area, the graveyard of St. Ulrich in 1778. The triangular square at the bottom is the so-called "Holtz-Platzl". Inside the cemetery there were four small chapels of which the biggest was consecrated to St. John of Nepomuk (the others were dedicated to Our Lady of Sorrows, The Shoulder Wound of Christ and The Holy Cross). Having the bell of the St. John's chapel rung on the occasion of a funeral cost 1 fl 30 x extra. After the cemetery had been closed in late 1784 this chapel for a short time was used as a stable. An overview of the three relevant sites as depicted on the 1778 Huber plan: on top the house Oberneustift No. 250, in the center the cemetery and on the right the parish church of St. Ulrich.